Emily and Bailey Hammett ended their4-H seasons on a high note. Both girls walked away with top honors at the Southeastern Livestock Exposition in Montgomery. The girls have shown their steers in 4-H shows all over the state this year. The final show was this month. 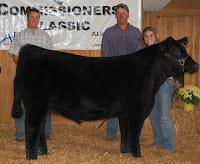 Bailey won Grand Champion Steer and will be featured in the Alabama Cattlemen's Association Magazine. Emily won the Showmanship award for division and her steer was one of the top five in the state. Congratulations to their WHOLE family. 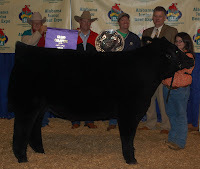 Every member of the Hammett family invested a lot of hard work and time into these steers. Best wishes for next year!